The last part of our mobile payment blog series talked about the Point-Of-Sale (POS) infrastructure and how device manufacturers are enabling secure payment transactions in products from laptops to printers to vehicles. As the world becomes more connected and mobile, payment functionality is being added to smaller objects of your everyday life. Whether it’s things you carry with you or things you wear, secure payment based on Near Field Communication (NFC) provides an unrivaled convenience. The next logical question is, how can secure payment functions be easily added to a variety objects? NFC is a remarkably intuitive technology to use and many thought NFC would spread like wildfire as it became available for payment transactions. The reality, though, is that adoption rates, while steadily increasing, haven’t gone up as quickly as some predicted. Why? Because even though NFC itself is easy to use, the process for deploying a secure NFC payment application hasn’t been so easy. NFC payments use a microcontroller-based circuit, called a secure element, to safeguard payment information and conduct the NFC transaction in a secure way. The secure payment functions are then added to the companion app that’s used by, for example, a wristband, so the wristband can start making payments. 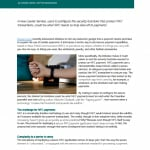 The complexity of deploying a secure NFC application comes, in large part, from the way the secure element is “onboarded,” or equipped with the service credentials needed for processing a payment. The Loader Service, which was developed by NXP, is available with NXP’s PN7x line of NFC modules. Each module contains an NXP secure element, the only Common Criteria certified EAL6+ product for mobile applications. The Loader Service is pre-configured on the secure element itself, as an applet and client, so developers have immediate access to the Loader Service. NXP’s Loader Service, used to configure the security functions that protect NFC transactions, could be what NFC needs to truly take off in payments. The Loader Service removes the need to manage infrastructure and maintenance tasks, reduces systems testing and minimizes risks of failure. Its standardized infrastructure empowers service providers to develop digital services once and deploy them across different devices and channels. NXP has recently initiated standardization of Loader Service under the name “Secure Element Management Service” with GlobalPlatform. The GlobalPlatform standardization will therefore greatly increase the scalability and interoperability of the Loader Service. Already companies are taking advantage of this quick-to-market ability to add payment to things like rings, fitness bands, car keys and clothing. As the payments infrastructure continues to develop, new use cases will become possible, creating interesting new applications for payment with “small” objects. Read the white paper “Loader Service: The Tipping Point for Secure NFC Payments” created in collaboration with MasterCard to learn more about the Loader Service, how it works and how it compares with the traditional SEI-TSM model.